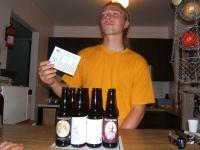 Saturday, June 17, 2006 was the 4th Annual Fool Circle Beer Tasting. Originally, it was to be held the following Saturday on the 24th, but because of circumstances two people would not have been able to attend. So, with about 48 hours notice, some how we pulled it off so all could be there, thank you Inner Circle. So all the regular crowd was there, Dave, Karen, Richard, Robert, Todd and myself. This year we would be playing for the prestigious Fool Circle Grand Pooh-Bah Cup, an AHA baseball cap (donated by Richard), a growler of Twin Lakes Brewery’s Greenville Pale Ale and two Twin Lakes Pint Glasses (limited edition, first running). We had a total of 12 beers we were going to taste this year that counted toward being the ‘winner’ and 10 more other beers we were going to taste just for fun. This year I decided to switch things up a bit. So all could play and all was fair, I decided to make it a totally blind comparison tasting. In previous years, someone would pour the beers away from everyone else and bring each beer out for all to sample. Each person had a score card where you could mark which beer you thought was which. The pourer could never ‘win’ for they always new which beer was which. So, this year I placed each beer into a brown bag, brought all the beers out at once, and let the others “cut-the-deck” just to be sure there is no way anyone could know which beer was which. And then, just to change things some more, I decided that instead of one beer at a time, this year we’d drink all 12 at once so we could compare and contrast the beers as we went, sort of set-up like a brewpub sampler. This year included: Pliny the Elder Clone, Thunderclp Wit, Red Card Ale 2, the Enigma Stout, Fool’s Initiation, Harvest Moon Brown Ale, Albino Pale Ale, Honey Pale Ale 2, Red Card Ale 3, Peated MacRae Strong Scotch Ale, Indian Brown Ale Clone, and the Hoppy Session Ale. For me, certain beers stood out like sore thumbs – the Thunderclap, the Enigma, and the MacRae while others were tricky like the 2 different Red Card Ales. Anyway, I personally liked the blind comparison tasting. I think it flowed better, maybe a little faster, the comparison part was very helpful and the anticipation at the end was great. In the long run one person guessed zero correctly and one person guessed ten correctly, and everyone else fell in between. But, the spoils go to the victor, and this year that title goes to me, Brian – the Fool Circle Grand Pooh-Bah of the 2006 Beer Tasting! After the official tasting, we began the tasting of the other 10. 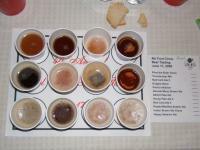 These included a mix of vintage Fool Circle beers, Garrett Sever Brews, and Twin Lake Brewery beers. We had, in no particular order, FC Red Card Ale 1, FC Honey Pale Ale 1, FC MacRae 04, FC Double Dubbel, FC Union, Sever’s Black Honey Ale, Sever’s Strong Dark Ale, Sever’s Imperial Stout, Twin Lake’s Pale Ale and Twin Lake’s Stout. We drank these knowing what they were and without having them ‘count’ for anything more than the pleasure of drinking them. Garrett got mad props from the crew, most wanting to try more, and Karen and Robert giving him credit on several other beers they’ve tried of his, in particularly the Oaked Vanilla Porter. Twin Lakes also got decent reviews with the Stout being the obvious popular favorite. The Fool Circle vintage brews were all over the place. The RCA1 was OK, the HPA1 was not too good but better then the HPA2, the MacRae was surprisingly sweet, the DD still needed more time and the Union came in under expectations with a too sweet kind of feel too. After all the beers had been tasted, we got our grub on and then chilled-out. This year the menu was stream-lined to grilled chicken sandwiches with potato salad and green salad with assorted muchies. The cooler was well stocked with Fool Circle brews, especially the Indian Brown Ale Clone and the Hoppy Session Ale. Some people left early, some people stayed for a bit, no one stayed for too long. It was a great tasting and a nice time hanging out. Honestly, I can’t wait until next year – I really need to get brewing!!! If you’re interested, revisit the 2nd Tasting and the 3rd Tasting here! This entry was posted on Saturday, June 17th, 2006 at 12:00 am	and is filed under Uncategorized. You can follow any responses to this entry through the RSS 2.0 feed. You can leave a response, or trackback from your own site.